Make these mini egg bake muffins on a Sunday and keep the on hand for a whole week of grab and go lunches. Preheat oven to 350°F. Prepare the muffin tin by spraying nonstick cooking spray into each cup. Heat the oil in a large non-stick skillet over medium heat and sauté the onions and garlic for about 7-8 minutes, until the onions are soft. Add the spinach and sauté for about another minute until it's wilted. Add the beaten eggs to a large bowl and stir in the milk, tomato, cheese, cooked sausage pieces, and spinach/onion/garlic mixture. Add salt, pepper and crushed red pepper flakes and give it a good stir. Pour into the muffin pan, distributing the mixture evenly among 12 individual muffins. Bake for 30 minutes. Let the egg muffins cool and wrap each one tightly in plastic wrap. Store in the refrigerator. When ready to eat, unwrap the egg muffins and microwave in 30 second increments until warm. Let the egg muffins cool and wrap each one tightly in plastic wrap. Then wrap the plastic-covered egg muffins with aluminum foil and store in the freezer. 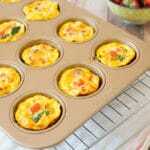 The night before eating, place the egg muffins in the refrigerator to thaw. When ready to eat, unwrap the egg muffins and microwave in 30 second increments until warm.